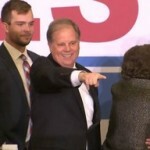 In a stunning upset, Democrat Doug Jones defeated Republican Roy Moore in the controversial race to fill the Alabama Senate seat left vacant by Attorney General Jeff Sessions. With 100 percent of the vote tallied, Jones led Moore by nearly 21,000 votes, a margin of 1.5 percentage points. In a stunning upset, Democrat Doug Jones defeated Republican Roy Moore in the controversial race to fill the Alabama Senate seat left vacant by Attorney General Jeff Sessions. With 100 percent of the vote tallied, Jones led Moore by nearly 21,000 votes, a margin of 1.5 percentage points. With Jones in the Senate, the Republicans’ majority will narrow to 51-49, endangering Trump’s agenda and possibly ushering in a Democratic wave in next year’s congressional elections. Roy Moore has so far refused to concede the race, and on Tuesday night called for a recount. We look at a major education victory in Philadelphia, Pennsylvania, where parents, teachers and activists mounted a successful campaign to reclaim control of their local public school system after then-Pennsylvania Governor Mark Schweiker declared it financially distressed in 2001. Under the plan, dozens of Philadelphia public schools closed, and the city saw a spike in charter schools. Community groups responded by forming a coalition to pressure Pennsylvania Governor Tom Wolf and Philadelphia Mayor Jim Kenney to return control over the School District to local voters. Last month, Mayor Kenney heeded organizers’ demands and called for the dissolution of the commission. This came as the city also elected civil rights attorney Larry Krasner as district attorney, who campaigned in part on ending the school-to-prison pipeline.